This white paper is one in an occasional series highlighting Elysium's consulting practice areas. 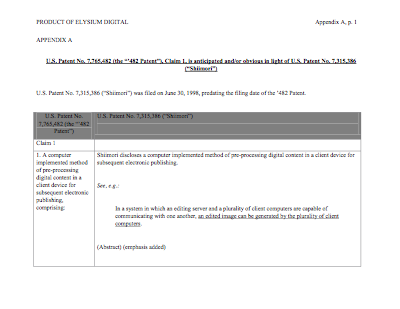 Elysium is not currently involved in the litigation concerning the patents discussed in this white paper. If you are interested in further information or analysis, please contact us at: (617) 621-3100, extension 156. Summit 6 LLC (“Summit 6”) has accused a number of web companies (Facebook, Photobucket, etc.) and mobile devices companies (Samsung, BlackBerry) of infringing two patents it holds. These patents (US Patent 7,765,482 and US Patent 6,895,557) belong to the same family and generally relate to a technique for uploading digital assets from a client device to a server, with configurable pre-processing and information capture performed at the client device prior to upload. The ’482 and ’557 patents share a priority date of July 21, 1999. Summit 6 has argued that various web services and mobile devices infringe its patents if they process photos on the client side (such as editing, resizing, changing resolution, etc.) prior to uploading them. Summit 6 has successfully won a judgment against Samsung for $15 million, and has settled against Facebook for $20 million. Recently, Summit 6 has expanded its litigation to include companies such as Apple, HTC, LG, Motorola Mobility, and Twitter, and has also asserted US Patent 8,612,515, which also appears to belong to the same patent family. Summit 6's successes do not mean that these patents are unstoppable. A broadly-applicable patent—which Summit 6 clearly believes each of these patents to be, given the scope of its legal action—is also broadly vulnerable. Each new trial requires a new determination of the scope of the specific claims asserted, which also creates a new opportunity to define the scope of the prior art that can be used against the patent. A fresh look at the field by technical experts may suggest new search areas for prior art beyond mere keyword matching. In this white paper, we discuss a brief prior art search against one of the claims in the ’482 Patent. We suggest some areas where further searching may yield good results, and present a few of our top results. To keep the white paper succinct, we focus on the first independent claim of the ’482 patent, claim 1. Summit 6 has asserted this claim in its new case, though it is unclear at this point what specific behaviors in the defendants' devices and/or services are being accused. transmitting said pre-processed group of one or more items of digital content to said server device for subsequent publishing to said one or more devices that are remote from said server device and said client device. Before starting the search against claim 1 of the ’482 patent, we brainstormed for some areas of prior art that might be relevant. We tried to be creative and broad in our thinking so that we could go beyond merely looking at keywords; instead, we wanted to focus on the underlying technical concepts that formed the allegedly novel aspects of the claimed invention. Computer-based faxing. Computers capable of faxing documents were well-established by the mid-1990s, though their use had begun to decline by the late 1990s. Converting a scanned or digitally produced document into the form necessary for fax is a likely candidate for pre-processing at the client end. Videoconferencing. Considerable research went into videoconferencing in the mid-1990s, where the limitations of transmission speeds and the significantly different capabilities of various computer hardware platforms posed the main design challenge. This was another area where the remote device might have defined what parameters the sending device could use. Print on demand. Another suggested avenue of search was uploading data (such as documents and pictures) to be printed remotely, where the end user did not necessarily have information on the print capabilities of the remote printer, or where the client computer might be expected to format the document or image according to the parameters provided by the remote printer or print server. ZMODEM. An early protocol for the transfer of data over a remote connection, we decided to investigate ZMODEM to see whether it required a formatting on the part of the client that would qualify as pre-processing. Server downshifting. In previous research and prior art searching based on the early days of the Internet, we’ve encountered servers that downshift the quality of the data both sent to and received from the client in order to preserve bandwidth. We decided that this would be another area worth exploring. Although our two-day search was minimal, we were able to generate sufficient results to make us think that further in-depth prior art search against this patent should prove fruitful. One area that proved useful was distributed image processing across a network, which is related to photo processing and print on demand. The best piece of art to emerge from this area was US Patent 7,315,386 (“Shiimori”). Shiimori describes a system where a client computer receives a template image from an image server, processes user image data according to the received template information, and sends the composite image to the image server to be printed. It also describes a system in which the client computer can reduce the resolution of an image to be printed to match the resolution of the output printer before transmitting it for printing. These disclosures read fairly well on the elements of claim 1. For details on how the Shiimori art maps to the claim elements, please see the claim chart in the appendix. A second area that proved rewarding was networked cameras designed to upload a series of images to a server for remote monitoring. The best piece of art to emerge from this area was US Patent 6,930,709 (“Creamer”). Creamer describes a networked camera that can upload images to a remote server for viewing by authorized viewers, and the camera pre-processes images to be uploaded in accordance with configuration options provided by the server, including color adjustment, date/time stamping, resolution, size, compression level, and so forth. For details on how the Creamer art maps to the claim elements, please see the claim chart in the appendix. We have not compared our results to the pieces of prior art used in earlier litigation due to some of the filings being under seal, but we did compare our results with US Patent 6,038,295 (“Mattes”), which was brought up in Samsung's motion for a new trial after it lost its case against Summit 6. The Mattes art describes a system where images may be transmitted via a telephone line to a remote server for storage and administration. We consider the two pieces of art we have found to be of equal or greater quality, especially because the relevant disclosures in the Creamer and Shiimori pieces of art are more detailed. Invalidating a granted patent depends on many factors: good lawyering, convincing arguments, appropriate claim constructions, and so on. But the foundation for the effort must be good prior art. Although we focused this prior art search on only one claim of the ’482 patent and performed the search and analysis within an extremely compressed period of time, we think the results are promising and suggest areas where excellent art may be found to invalidate at least some of the claims of the patents at issue.